Esther Lillian “Kuzee” Gates aged 94, of Grand Rapids, MI transitioned into the open arms of her Lord and Savior on June 8, 2018. Her faith was strong as she saw life as just passing through to eternity in heaven. She claimed that one of the most important moments of her life was to make public profession of faith at the age of 19, alongside her cousin, Dave Zylstra. Esther was the second to the youngest of eleven children and the last remaining. She was born in Grand Rapids on Easter Sunday, April 20, 1924. Growing up she said she was spoiled and could get away with almost anything. Her younger sister, Char, a dear lifelong friend talked with her on the phone three or four times a day. Esther described her mother, who raised eleven children, as a saint, very loving, kind, generous, patient and understanding. She described her father, Cornelius “Casey” Kuzee as very stern, demanding obedience. He drove truck for Grand Rapids Builders Supply and was never late for a day of work. Esther looked forward to being reunited with all her siblings, especially those who died so tragically at a young age. In 1926, her brother, Bobbie, was struck by a car at age six and was killed. In 1930, her oldest sister, Marguerite, died suddenly of a heart attack at age 20, followed by her brother, Russ, dying of a heart attack at age 20 while playing basketball in 1935. Her faith has always been a big part of her life influenced by her mother, Gertie, who came to America from the Netherlands at the age of nine with four siblings in 1892. With the promise of prosperity, they settled into the west side of Grand Rapids where they clustered with families, church congregation and culture intact, with conservative characteristics drawn from their Old World background in Kollem. They were bonded by their “Dutchness”. Esther was always active in church belonging to women’s groups, bible study, and choir. She was never afraid of giving her testimony, even days before her passing. She regularly read the Bible, devotional materials, and enjoyed watching one sermon after another on television. When asked about her goals in life she says that they have always been to live a full life walking closer to the Lord and to know that by growing to love God above all, everything else will fall into place. Her favorite Bible verse Romans 8:28 was, “All things work for the good for those who love the Lord.” She believed that if you choose to love the Lord, you will always be blessed. She felt that she had always been blessed with good health and a loving family. She always tried to be an Ambassador and a witness playing hymns and singing. She feels that God called her to play the piano at a young age. She practiced faithfully every day, even playing weeks before her death. When she first started earning money while working in the payroll office at American Seating, she bought a Hammond organ and held a recital for her co-workers. She sang in choirs most of her life and at a young age, remembered singing on the corner of Leonard and Alpine with the Salvation Army. At age 15, she took marimba lessons and bought her own marimba from an ad in the paper. She kept a log of all the places she played, and it had over 80 entries only being paid once, $5 at a Senior Citizen Center on Burton by Division. Most of the music she enjoyed playing were hymns, praising God. She was the pianist for Riverside CRC, her church home, and for Breton Terrace of Holland Home for four years after being one of the original residents 16 years ago. Getting married and raising seven children were the most significant events in her life. When she was 26 years old, Elmore “Bud” Gates, called her and asked her out to a baseball game. They shared laughter and became engaged two months later. Bud had unexpectedly lost his first wife to complications of surgery at age 28 and had to find a mother for his infant son, Ken. They met in September, 1950 and were married on May 4, 1951. 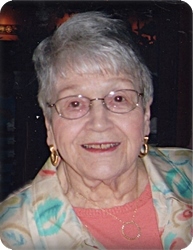 She was happily married for 61 years when Bud passed away on January 19, 2012. Esther claimed that the soundest investment they ever made was investing in Christian education, at great personal sacrifice, and instilling high values in all their children. She was a stay-at-home mom and enjoyed cooking, knitting, crocheting, Boggle and Scrabble; playing Scrabble up until the very end. She always looked forward to receiving the Grand Rapids Press just to do the word scramble. Sometimes she would lay awake at night with word combinations running through her head. Even at a young age, she was considered a “jolly person”. She remembers being the class clown in school and always had a keen sense of humor making a point to joke with everyone she met wherever she went, even when her health was failing. She saw her positive, upbeat attitude as part of her witness. Towards the end, she couldn’t wait to be reunited with her family in heaven who had gone on before her. Her hospice worker said due to her strong faith, he had never seen anybody so “accepting of her demise”. She is survived by all seven of her children, Ken (Dori), Ross (Barb), Terry (Kim), Craig (Marcie), Darla Lamancusa (John), Brent (Rebecca), and Ron (Lelaine). She has 14 grandchildren and three great-grandchildren. Her family meant everything to her and she will be dearly missed by all who knew her. The family will be having a memorial service at Breton Terrace, 2500 Breton Woods Dr. SE, Grand Rapids, MI 49512 on Saturday, June 30, at 2:00 PM.